There are 230 guests and 2 registered users on-line. Dusty can play the hell out of the slide. Very authentic. Has that 'Mississippi Mud' tone happening. His playing takes ya way back in the alley. He is deserving of our respect and patronage. If you like the old blues, you will dig Dusty. 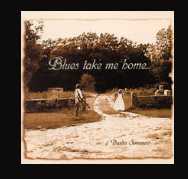 After listening to this cd (Blues Take Me Home) for a couple of days, I find it to be a very enjoyable record. A link to the old blues of Charlie Patton and Tommy Johnson. Dusty claims to be an uneducated musician, which is half right. He is a musician. A blues musician. It is obvious he has dedicated many years to learning these old blues forms and in the process, he became a blues master. The tunes on the cd are the ones almost any person who has sat on the porch and picked the blues with his pals play. This is a good primer for anyone interested in hearing them played right. You will not hear any sampled phrases, or synthesizers, no turntables scratching, no fancy production at all, just a few guys, playing the blues, and playing them right. Blues Take Me Home feels good. If acoustic blues interests you at all, this is a winner. Dusty plays some mean slide through out, and is joined by some wonderful players. I am glad there are people like Dusty who continue to play this style of music. For some reason I find it important.